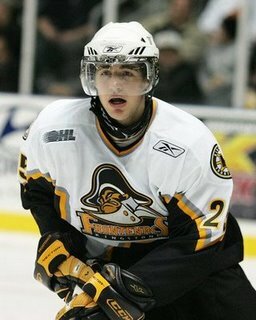 Losing captain Ethan Werek to a torn ACL will probably cost the Kingston Frontenacs their playoff series against the Brampton Battalion. The Canadian Hockey League’s post-season continues to roll along, with many first round match-ups being settled in the past couple of days. There are now six series waiting to be resolved in the Quebec Major Junior Hockey League, Ontario Hockey League and Western Hockey League. The QMJHL’s two remaining series will be wrapped up Tuesday night as the Rimouski Oceanic host the Chicoutimi Sagueneens and the Gatineau Olympiques visit the Montreal Junior’s home ice in Verdun, Que. Quebecois junior hockey fans should expect Montreal and Rimouski to prevail and move on to the next round. The OHL’s quarter-finals are just waiting on the Tuesday night finale of the Frontenacs – Brampton Battalion series in Kingston. Ethan Werek’s devastating knee injury on Sunday coupled with the triumphant return of the Battalion’s Cody Hodgson spells out defeat for the Frontenacs. Expect Brampton to meet the Barrie Colts on Thursday night. There are three series still on the go in the WHL. I’m sticking to my earlier prediction that the Calgary Hitmen will be able to beat the surprising Moose Jaw Warriors. The Silvertips should still be favoured to snuff out the Kelowna Rockets in Everett on Monday night and the Portland Winterhawks should be able to eke out one more win over the Spokane Chiefs. The Saint John Sea Dogs advanced to the Quebec Major Junior Hockey League quarter-finals with a decisive victory Friday night. The Saginaw Spirit held on to beat the Kitchener Rangers 4-3 in a physical Ontario Hockey League playoff game Friday night. Tyler Bunz came up big as the Medicine Hat Tigers took the lead in their Western Hockey League playoff series. Goaltender Nicola Riopel's stellar play is putting the Montcon Wildcats further into the Quebec Major Junior Hockey League playoffs and his name into the record books. The Calgary Hitmen survived a rally by the Moose Jaw Warriors to post a 7-3 win and even their Western Hockey League playoff series Saturday night. Philip-Michael Devos was the overtime hero Sunday for the Victoriaville Tigres. The Kingston Frontenacs tied their Ontario Hockey League playoff series 3-3, but lost captain Ethan Werek in the process.